Sheriff's deputies in Texas were confronted with a chilling situation on Thursday when they responded to an animal welfare call and found a deer with a Halloween pumpkin stuck on his head. Thankfully, police were able to lift the headless horse-deer's curse. 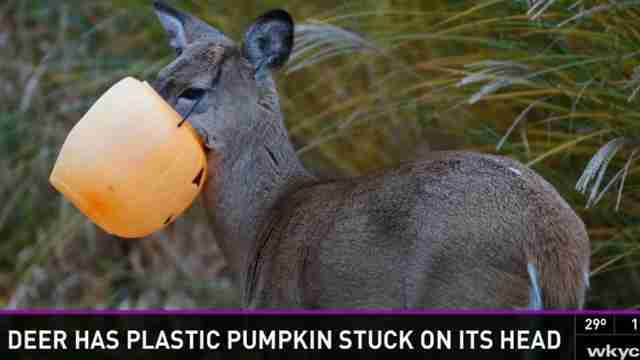 The deer escaped his plastic prison uninjured after officers coaxed the animal to them and pulled the pumpkin from his head, according to KXAS-TV. "We are happy to report that the deer survived," wrote the Hays County Sheriff's Office on Facebook. "Kudos to the deputies for saving a life." Last year, it took nearly a week to free a similarly afflicted deer in Ohio. "When I grabbed it we went to the ground and this thing snapped off," said the teen who ultimately saved the deer by hiding in camouflage and jumping at the animal. "It had to be done today. There was stress on that deer because it couldn't eat."